A cat-angel joined the choir at Myeong-Dong Cathedrals 2010 Christmas Mass. 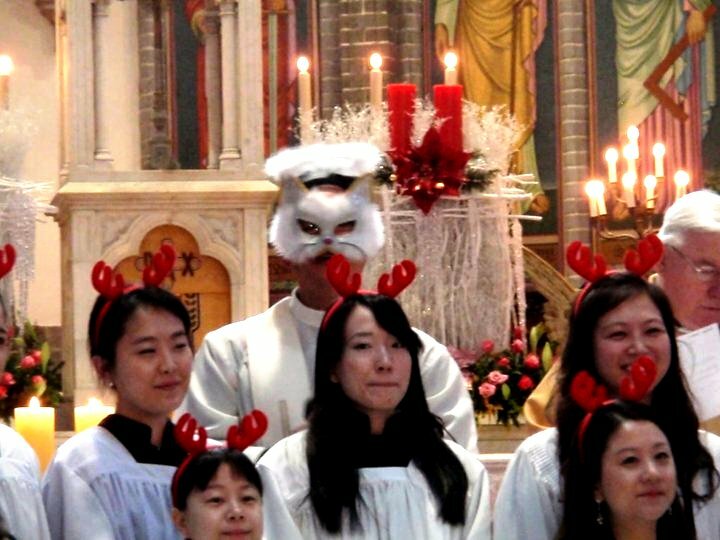 Nothing could stop squeals of laughter from both children and adults as the cat-angel appeared during Myeong-Dong Cathedrals Christmas Day Mass this past 2010 Christmas. Towards the end of the English Mass held at 9:00am, about 12 altar boys and girls joined together to sing "My Christmas Tree" in English as a special treat for foreigners in Korea. The group looked particularly beautiful in their white altar clothes, and their red reindeer antlers showed off their Christmas spirit. Everyone in the church was genuinely excited, and many people brought out their cameras to take live video and pictures of the group. One of my students is the main altar girl for the mass, and I couldn't help but snap a few photos of her with those cute antlers on her head! The altar girls were having a hard time not laughing! 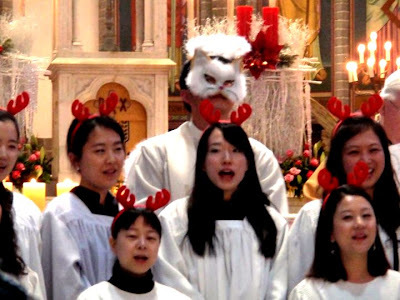 The singing was going great, but then suddenly a man entered from behind the group wearing a cat-angel mask. Everyone started laughing, even the small choir as the man enjoyed his solo. The mask was complely absurd looking, and as you can see from the picture it is a hybrid between a cat and an angel. Whoever gave him permission to wear that costume in church had a serious sense of humor! We thought the fun was all done, but then the Irish priest joined in and sang a solo during the last two lines. His deep voice clearly had not been used in a while, and right after the song he announced with his thick Irish accent "the last time I sung I was drunk, and the next time I sing I will be drunk!" Everyone raved with laughter, and I personally was relieved to see his funny Irish personality revealed after such a serious mass about helping the homeless. Myeong-dong Cathedral is one of the only churches in Seoul that offers English Masses. But be prepared for unusual circumstances at special services around the holidays! You just might just see another mixed animal costume and a cool Irish priest in the future. To learn more about Myeong-Dong Catheral visit "Enjoy Myeong-dong Cathedrals Gothic architecture and attend an English Mass". What are the names of the altar girls?